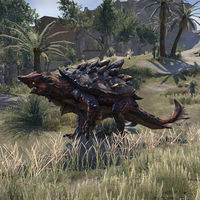 Haj Mota are large shelled creatures found in Hew's Bane, the Blackwood Borderlands, and Murkmire. A melee attack that does moderate physical damage and staggers the player. The enemy spits a glob of poison at the player doing moderate poison damage and snare. Getting hit by the glob will spawn a Toxic Pool under the player's feet. A pool of poison appears under the player's feet as indicated by a red circle. The pool does moderate poison damage over time. The enemy burrows underground and charges at the player, doing moderate physical damage and knocking the player down as indicated by a red circle. The enemy releases shockwaves in the direction it is facing that travel along the ground, doing moderate physical daamge and staggering all players hit as indicated by red circles. This page was last modified on 26 December 2018, at 00:15.